A day after issuing a joint press statement condemning in very strong terms, the September 18, 2015 demolitions in Ijora Badia, the Friends of Badia, comprising 18 individuals and civic groups led by Spaces for Change met on Tuesday, Sep 29, 2015 in Lagos to develop and take joint actions toward ensuring that there are no further evictions in Badia. Some of the Badia evictees updated on their current situation since the demolitions. “We have been hanging around the remains of our demolished homes, hoping that the government will come to our aid, ” Mrs. Ogunyemi told Friends of Badia. Representatives of community-based organizations from other informal settlements in Lagos threatened with evictions also came to show solidarity with the evictees. Comrade Agbodemu Musibau expressed fears that if necessary steps are not taken urgently to stop the evictions in Badia, this will embolden landowning families like the Ojora Chieftaincy Family and collaborating agencies of the Lagos State Government to tear down the hovels of the poor, and hand them over to rich property developers. Friends of Badia appraised a range of legal issues arising from the Badia demolitions, exploring the emerging opportunities for legal and administrative resolution of the recurrent evictions in Badia communities. They will provide legal and technical support to the evictees in order to secure a lasting legal or administrative resolution of the recurrent evictions in Badia communities. 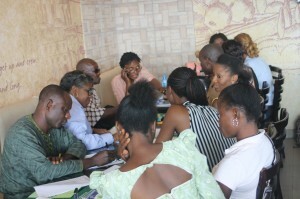 In addition to brokering high-level meetings between the evicted, the landowning family and officials of Lagos State government, participating organizations are undertaking collaborative media and advocacy action designed to increase the capacity of target groups to mobilize around specific issues, build alliances across local communities to tackle concerns of collective significance and influence change .